Declaring “manufacturing is back,” Vice President Joe Biden gave a rosy — but not entirely accurate or complete — picture of U.S. manufacturing at a March 28 campaign stop in Iowa. Biden also cherry-picked his job figures when he declared the U.S. has added “430,000 new manufacturing jobs just since 2010.” That’s true. But since the start of the Obama administration in January 2009, the U.S. has 661,000 fewer manufacturing jobs — despite the recent job gains. In fact, manufacturing jobs represent a disproportionate share of job losses since Obama took office. In all, the U.S. has lost a net 864,000 non-farm jobs since January 2009 — a decline of one half of 1 percent. But manufacturing jobs are down 5 percent since then. One recent study found that at the current pace, it will take until 2020 for the U.S. to recover the manufacturing jobs lost since 2007. 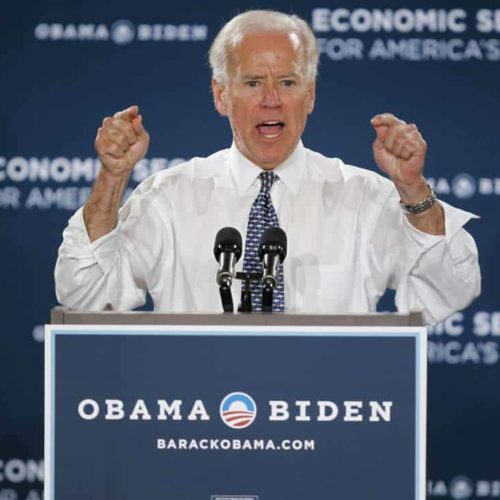 But, in describing the economic situation the Obama administration inherited, Biden overstated the number of manufacturing jobs that had been lost before he took office. Biden would have been correct if he had left out the phrase “before we came in.” It’s true that the U.S. lost 5.8 million manufacturing jobs during the 2000s — from January 2000 (17.3 million jobs) through December 2009 (11.5 million), Bureau of Labor Statistics show. But that includes one year of the Obama-Biden administration, which started in January 2009. To determine the number of jobs lost “during the 2000s, before we came in” you would have to look at the difference in jobs from January 2000 (17.3 million) to January 2009 (12.6 million). That’s 4.7 million jobs lost, so Biden was off by about 1.1 million jobs. Now, Biden was correct when he said the U.S. has added “430,000 new manufacturing jobs just since 2010.” But this ignores the job losses in 2009, which, as we just noted, were pretty severe. In all, since Obama took office, the U.S. has lost 661,000 manufacturing jobs. There were 11,891,000 manufacturing jobs in February 2012, down 661,000 since January 2009. That’s 5 percent fewer manufacturing jobs. By contrast, there were 132,697,000 total non-farm jobs in the U.S. in February 2012 — down 864,000 since January 2009. That’s a decline of a little more than one half of 1 percent. Information Technology & Innovation Foundation, March 19: Others now argue that because a few manufacturing jobs have returned that the United States is poised for a manufacturing renaissance. But the rebound looks as good as it does only because the prior loss was so steep. The United States lost two million manufacturing jobs during the Great Recession, and since then a little over 166,000, or 8.2 percent, have returned. At the rate of growth in manufacturing jobs in 2011, it would take until 2020 to return to where the economy was in terms of manufacturing jobs at the end of 2007. This is an issue you can expect to hear a lot about. The Obama campaign just released a Web video that says “under Obama the manufacturing sector has experienced 31 consecutive months of growth and added hundreds of thousands of jobs.” That’s true — as far as it goes — just as Biden is correct that the U.S. has gained manufacturing jobs in the last two years. But that’s not the whole story.